An exciting new and strategic church development is emerging in Point Cook, west of Melbourne. Initiated by Cross Culture almost four years ago, supported by CCVT’s GAP (Grow A Plant) program and financed by CCFS, the establishment of this church facility is a bold step in CCVT’s desire to create a “community of hope and compassion” in what is Australia’s largest housing growth corridor. The building is expected to open in late 2016 and is an integrated facility that includes child care and professional offices in addition to a church offices and auditorium that can also be used as a community centre. 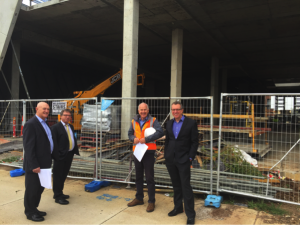 Standing in front of the development from left to right are Pieter Brink (the soon to be appointed CCFS State Manager for WA), Frank Morabito (CCVT Finance Director), Colin Cameron (CCVT Property Manager) and Joel Plotnek (CCVT Team Leader, Operations).